Surf City Garage Speed Demon Wax Detailer - 24 oz. 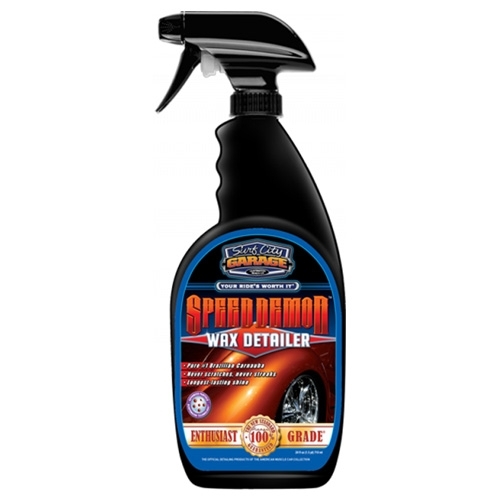 Surf City Garage Speed Demon Wax Detailer is specially designed to maintain your ride’s shine between wax sessions. Speed Demon uses Advanced Particle Suspension Technology to actually suspend dust–so it absolutely, positively can’t scratch your paint. Its advanced polymers and Brazilian Carnauba wax also block damaging UV rays and penetrating surface contaminants. Speed Demon works great on chrome and glass, too. So before you put your pedal to the metal, spray on Speed Demon for the fastest-acting, longest-lasting, zero-buildup shine around. Directions: (1) Shake before use. (2) Spray a light mist on surface of car. (3) Dry with a clean towel (microfiber or soft cotton). (4) Lightly buff. Surf City Garage Barrier Reef Carnauba Spray Wax - 20 oz. Bought this not knowing how it was and was totally blown away. Not only is it a great quick detailer but it also has carnuba wax and leaves a slick surface on your paint. If you haven't tried this product you are missing something great. Try it you will love it.